Parents & Carers, Childminders, Grandparents bring your little one’s along for PLAY – BOUNCE – FUN. This is an informal playgroup for ages 5yrs & under. 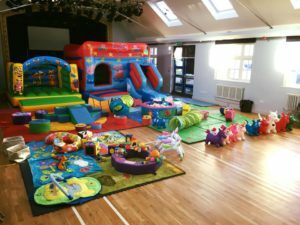 Exciting play inflatables & soft play each month. Ride on’s, baby area & ball pool. Lots of fantastic equipment to explore. under 7mths free with full paying child.